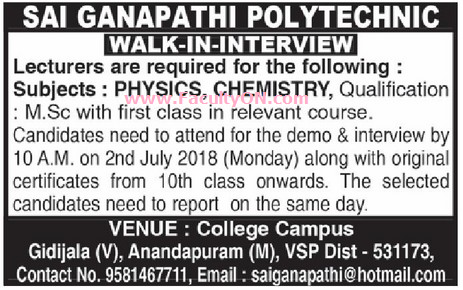 Sai Ganapathi Polytechnic College, Visakhapatnam has advertised in the EENADU newspaper for recruitment of Teaching Faculty- Lecturers jobs vacancies. Interested and eligible job aspirants are requested to walk-in on 02nd July 2018. Check out further more details below. About College: Behind establishing this college is 30 years of experience and dream to provide high quality technical education exclusively for students for their empowerment through technology and science. How to Apply: Interested candidates are required to attend for the demo & interview along with CV, originals certificates from 10th class onwards, copies of certificates and recent PP size photos to the walk-in address given below.